I’m happy to introduce my delicious sweet manju pastry recipe to you today. I researched the origin of this pastry on the internet, some bloggers and Wikipedia say the idea of this pastry originated a long ways back in China, as Chinese dumplings are made with fillings and dough skin. When these dumplings were introduced to Japan, the Japanese modified the dumplings and made them into pastries by adding fillings made with sweet beans. They called this manju. 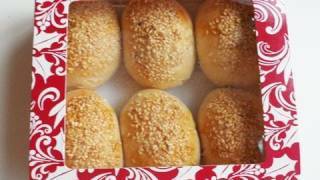 Eventually manju came to Korea, which is where I learned it. I’m not sure if the taste of my manju is different from the original Japanese manju because I’ve never tasted Japanese manju. If you know more about the history and tastes of different manju, please let us know about it in the comments. Where did I get this recipe? I was very excited the first time I had this homemade manju visiting my friend Jeongjin’s house in Korea. Jeongjin would make so many delicious dishes and I loved whatever she made. She was generous about sharing her recipes with me and my other friends. It was a big revelation for me to see that we could make such delicious sweet pastries at home and not have to buy them at a bakery. As soon as I tasted these, I knew I had to make them. This is Jeongjin’s recipe. She and I lost touch years ago. I’m wondering if she still keeps cooking these days. Whenever we met each other, we talked about new delicious dishes and recipes and learned from each other. If you feel your heart beating quickly when you see this video recipe today, you’ll know how I felt the first time I saw them being made. You and I are really in the same boat. : ) If so, “Cheers” to you! 1 cup lima beans, ½ cup sugar, ½ ts salt, ¾ cup flour and ½ cup extra flour, 2 eggs, ¼ cup sesame seeds, ¼ cup sweetened condensed milk, 2 ts of vanilla extract. Let’s make sweet filling first! Soak 1 cup of lima beans in cold water overnight (for about 10-12 hours). Pop the beans out of the skins with your fingers. Place the beans in a heavy bottomed pot with 1¼ cup of water and bring to a boil over medium high heat for 10 minutes. Lower the heat and simmer for about 35-50 minutes until the beans are soft and fluffy. Mash the beans with a wooden spoon until they have the consistency and look of mashed potatoes. Add ½ cup sugar, ¼ ts salt, and 1 ts vanilla extract and keep stirring for about 1-2 minutes with a wooden spoon to thicken the filling. Keep stirring so the filling doesn’t burn or stick to the bottom of the pot. Turn the heat off and cool down. Add ¾ cup flour, 1 egg, ¼ ts salt, ¼ cup sweetened condensed milk, and 1 ts vanilla extract to a mixing bowl. Mix it well with a wooden spoon until smooth. Divide the dough and the filling into 8 same-sized balls on a floured cutting board. Flatten out each dough ball by pressing it down with the palm of your hand. Place a filling ball into the center of a flattened dough ball. Wrap the dough around the filling. Seal the edges of the wrapped dough and form into the shape of an egg. To make a chestnut, first make a ball and then gently pinch a point at one end. Leave the other end rounded. Dip the side of egg shaped manju into water first, and then dip into sesame seeds so the seeds stick to side. For chestnut shaped manju, dip the top into water, and then dip the top into seeds. Brush the egg yolk over the sesame seeds on egg shaped manju. For chestnut shaped manju, brush egg yolk below the part where sesame seeds are on so that the color will change into brown when it’s baked. Repeat for each pastry, and place the manju on a cookie pan lined with a baking sheet, with the sealed part of the manju on the bottom. Bake in the oven at 350°F on the middle rack for about 20 minutes. If you make chestnut shaped manju, bake them a little longer for a deep, rich color. Serve as a dessert or snack. Posted on Wednesday, June 22nd, 2011 at 2:37 pm. Last updated on April 26, 2015. Posted July 2nd, 2017 at 9:54 am | Log in to reply. it’s not easy to find the nut here so i change the filling with banana filling n aloe vera filling. thanx for recipe..
Posted November 7th, 2016 at 8:17 am | Log in to reply. I am making manju for a fundraiser and I was wondering if I could make them a few days in advance. How long do they keep for? Posted October 22nd, 2014 at 11:07 am | Log in to reply. Posted October 22nd, 2014 at 7:09 pm | Log in to reply. Yes, sure! You can use red beans (azuki beans https://www.maangchi.com/ingredient/red-beans) too! Posted February 25th, 2016 at 12:40 pm | Log in to reply. Hi Maangchi. This is my first time to post my comment and I just want to say that I am so happy to know you and your Korean recipe. I really want to try everything you have shared especially since some of them are my favorite delicious foods. What I want to ask here is about the red bean you have to use instead of the bean you used in this recipe. After I soak the red bean in the water, do I need to pop the bean out of the skin just like you did or just boil it with the skin? Posted July 22nd, 2016 at 1:33 pm | Log in to reply. If you’re using adzuki beans, you don’t need to do anything with the skin. Just rinse the beans first. Also, if you want to make more of a paste, I recommend stirring the cooked beans for a bit longer than 5 min. Around 10? Make sure you’re using low heat though. Canned red bean paste can also be pretty good. Hope this helps! Posted October 17th, 2014 at 9:04 am | Log in to reply. So my first batch had failed, the skin was way too hard. I made the second batch and it turned out great. The failing point was from the bean. The shop around my house only has small lima beans and they need more time to soak (I soaked the second batch 24 hrs) and to make sure to close lid while boiling. Because the filling was too dry the first time (the bean was hard I couldn’t mash after 50 mins boiling, so I use mixer to blend them) it cannot help moistening up the skin while cooking I guess. Posted June 5th, 2014 at 6:06 pm | Log in to reply. I made this delicious pastry today. I think I might have had some air space or too much moisture inside because many of my pastries burst. Thank you for the delicious recipe! Posted February 21st, 2014 at 8:30 am | Log in to reply. Are the cups in the recipe US or Metric cups? Posted January 11th, 2014 at 4:19 pm | Log in to reply. Posted January 7th, 2014 at 4:24 pm | Log in to reply. Hi Maangchi! When i cooked the lima beans, i must have put in too much water! Now its all runny and doesnt thicken.. What should i do? Posted January 8th, 2014 at 10:15 am | Log in to reply. oh, it sometimes happens to me, too. I dehydrate the paste with a microwave oven. I just put the paste in my microwave oven and cook a few minutes and take it out and stir it with a wooden spoon. If it’s still wet, repeat it again. Posted September 12th, 2013 at 1:33 pm | Log in to reply. Hi Maangchi! I’m going to try making these tomorrow, but I was wondering if they froze well. Like if I made a lot, but wanted to freeze some to use later. Let me know, thanks! Posted September 13th, 2013 at 3:06 pm | Log in to reply. yes, you can freeze it up to 3 months! Thaw it out at room temperature when you eat it. Good luck with making delicious manju! Posted April 27th, 2013 at 11:28 pm | Log in to reply. Just found out your ‘drooling’ site recently.Since you haven’t posted much on pastries..so I have one request on this one recipe..I’ve once watched it in a Korean variety show..it is called Chap Ssal Bbang or Mochi bread. I’ve search high and low for this recipe but have only found a premixed flour version..not homemade scratch version.So I wonder you could post the tuts for this.Your kindness is greatly appreciated. Posted March 16th, 2013 at 12:00 am | Log in to reply. This recipe was originally posted on June 22, 2011 at 2:37 pm by Maangchi. It was last updated on April 26, 2015. The video was watched 535,503 times on YouTube & has 5,800 likes!